For nonprofits, the need to build and execute marketing programs that support an organization’s strategic and development goals is critical. It’s not just increasing visibility, boosting awareness and enhancing name recognition. It’s about marketing that generates measurable results, be it cultivating a new pool of donors, securing volunteers or attracting the right corporate partners. While the channels through which a nonprofit may work to achieve these objectives vary widely among causes, the basics still apply – be relevant, be authentic, be creative and keep your audience top-of-mind. Now, let’s get started building an action-oriented marketing roadmap for your cause. While ambitious development goals may make you inclined to ask for a donation right out the gate, take a step back and remember that donor relations, community relations and public relations are based on relationships. Think of this as the networking cocktail hour before your annual gala – it’s a time to get acquainted. As you get to know prospective volunteers, donors, brand ambassadors and corporate partners, they are getting to know you – learning about how you uphold your mission, the impact you make on the community and how the support of existing volunteers, donors, brand ambassadors and corporate partners help you to achieve your goals. This ‘getting-to-know-you’ period is the time for soft, no-to-low risk calls-to-action. Think sharing a Facebook post, offering a retweet or even simply liking or favoriting a piece of online content. Offline, it may entail picking up a copy of a brochure or annual report. So how does one go about driving these actions through marketing? While openly asking people to take a specific action is completely acceptable, creating content that people will crave and feel motivated to share is key. It’s about fostering an emotional connection to the cause, which takes us into phase two. Whether you’ve decided to launch an online advocacy campaign and need stakeholders to send letters of support to a legislator or are seeking new volunteers for your mentoring program, it’s important to hone in on what motivates people to take action. For some, it’s the idea of being part of something bigger and gaining a sense of belonging. For others, it’s about their personal branding and wanting to be sure that philanthropy is part of their legacy. Regardless of people’s individual motivations, it’s paramount to focus on the ‘why’ and to also answer, “What’s in it for me?” While this question doesn’t speak to the heart of philanthropy or volunteerism, answering it helps to build an emotional connection to your cause because people start to feel empowered to make a difference. With the desired action and value proposition both clearly defined, you’re ready to make the ‘ask.’ Go multi-channel (from social to email to phone calls and in-person meetings, if appropriate) and leverage your existing network of supporters to inspire others. You can even reach out to 15-20 influencers in advance of launching the campaign and ask them to share it – via social, tell friends, etc. – at the onset with others who are less familiar with your cause. To amplify your reach, be sure any web- or social-based campaign has share buttons installed at relevant junctures to ensure the most people are seeing your news. Let’s say 50 new supporters joined your online advocacy campaign and, by extension, opted into your email database. Now what? It’s time to take the lessons learned from your prior campaign and use them to drive repeat action. Perhaps you found asking people to tag five friends on Facebook and inviting them to submit letters to their legislators yielded the most engagement. Maybe the click-through rates from your email marketing set a new record for your organization. Once you know which channels contributed the most to achieving your end goal(s), it’s time to evaluate the messaging that drove the most action. Take it a step further; at what time(s) did you deploy those top-performing updates? Using all of these analytics as a guide, you’re well-poised to deploy your next action-oriented marketing campaign. Now, how do you keep your new constituents engaged? It all comes back to relationship-building. Consider sending a personal email or hand-written note to new supporters thanking them for their involvement, making a personal call to the handful of folks who lent the most support, etc. Further, deploy an email marketing campaign or strategically-timed and creatively-packaged social media marketing updates to keep your cause top-of-mind. So, let’s recap. 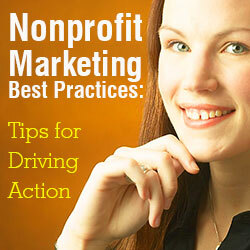 How does one best use nonprofit marketing to drive meaningful action? Create calls-to-action that are clear, concise and compelling. Ensure calls-to-action are easy to take, and low-risk for folks who are new to your cause. Leverage existing supporters to augment the success of your campaign. Measure your outcomes and use the data to inspire repeat successes. Danielle M. Cyr is vice president of integrated marketing for Co-Communications, a full-service marketing and public relations agency with offices in Connecticut and New York. Co-Communications has served as the CT Association of Nonprofits Endorsed Partner for Marketing and PR since 2012.